Jade's seamless one-piece freestanding bathtubs are beautiful and contemporary. Designed both for quality and comfort the slim edges will transform any bathroom into a getaway, adding style and class. Adjustable legs and integrated chrome overflow and chrome drain are included for convenience and style. The adjustable legs allow for an easy sturdy installation. Turn your bathroom into your personal oasis and melt away the stress of the day with any of Jade's freestanding bathtubs. 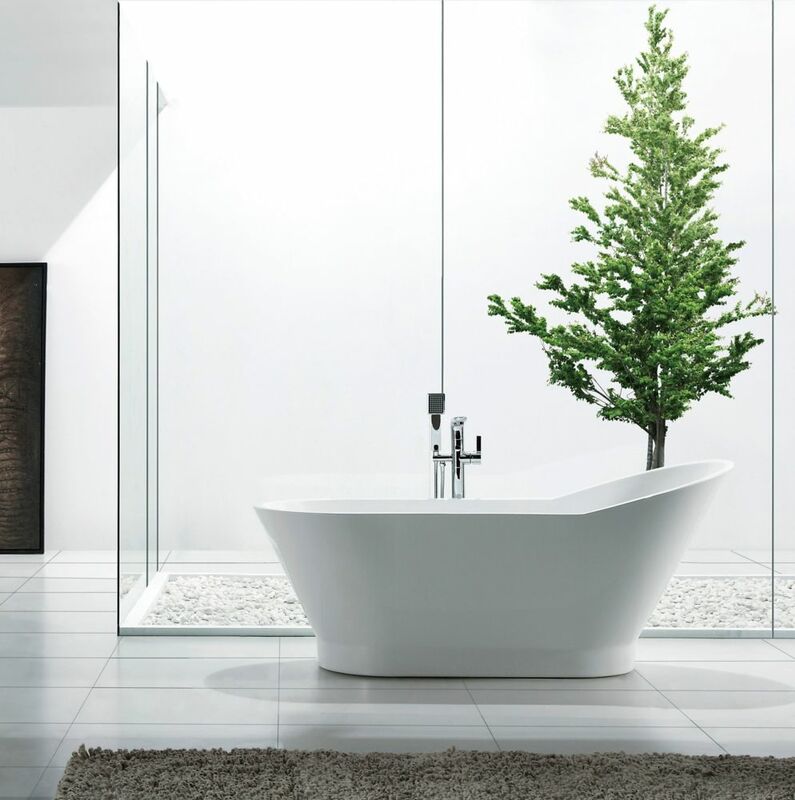 Luxurious and affordable the MAAX Antigua bathtub is the best option for your renovation project. Designed for drop-in or alcove installation, this tub features a spacious interior for two bathers. Two raised neckrests and a smooth bottom add comfort while the two polished chrome finish solid brass handles add style and safety. The durable high gloss acrylic will keep its shine for years to come. Bathroom makeover is made easy with the MAAX Cocoon 6054 corner tub with smooth lines and decorative trim made from a durable high gloss acrylic that will shine and last for many years to come. This tub will be a definite eye catcher in your newly renovated bathroom. Designed for podium installation, this tub features a large bathing well for two bathers, ergonomic headrests, as well as built-in armrests which all contribute to the comfortable experience. Celine 59 inch Acrylic Oval Freestanding Soaker Bathtub in White is rated 2.8 out of 5 by 4. Rated 1 out of 5 by wayne from No instruction manual There was no instruction manual included in the packaging. It was a homedepot online exclusive -- Jade Bath Celine 59" Acrylic oval. Reseached the company Jade that makes the tub and they do not have a tub by this name. It does appear to look like a Zoe59 tub. Downloaded the instruction manual but the information is completely different than the parts that come with my tub. Otherwise looks like a decent tub. Rated 4 out of 5 by Gwen from Love my new tub I love my new bathtub. It fits perfectly in our new bathroom. My granddaughter loves to play in it. I love the sleek design with the high end to rest my head on it. Rated 1 out of 5 by Alex from Great look horrible functionality The drain is horrible. The seal provided does not stop the water from leaking from the tread. Rated 5 out of 5 by CaptJack from Just what the lady of the house wanted! Very nice, comfortable soaker tub for smaller bathrooms. Great looking and easy to install.